Let’s talk – Torque, Torc or Torq? 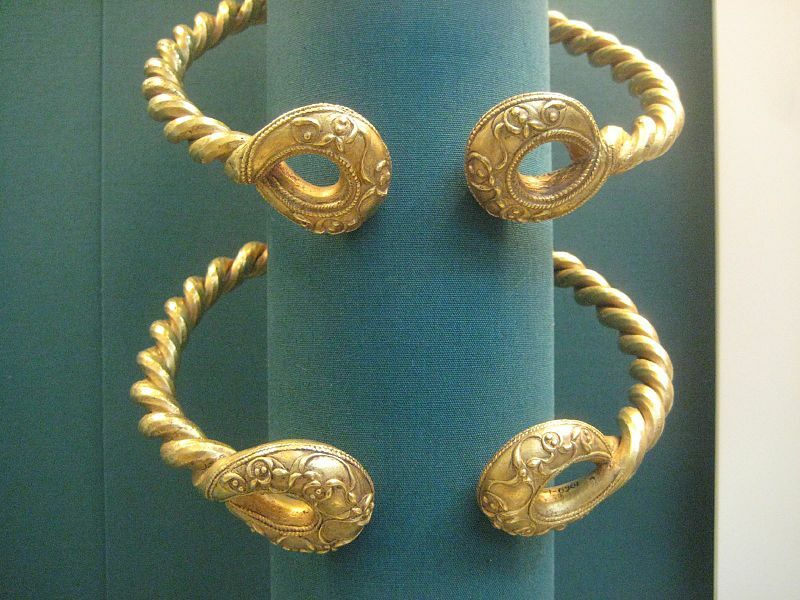 This gorgeous piece is known as a torque, possibly torc, and maybe even torq. The word is derived from the Latin torquis meaning ‘to twist’. To purchase your very own slice of vintage history click on the bracelet. Or torque. Here is a stunning suite of vintage jewellery. A rare Swarovski brooch (or pin as they like to say over The Pond), with matching ear clips. Using green and blue Swarovski Crystals and signed using the Swan Logo. These gems are the antiques of the future, and a fabulous addition to any costume jewellery collection. They can be yours by clicking on the photo! ‘It’s always better to be slightly underdressed’ – in a Chanel suit? Here we have a fabulous Chanel suit. In the age of Primarni and 99p knickers, who on earth would want to spend £1,000’s on couture? But you don’t have to spend thousands – this suit is for sale for just £299. Think about pay per wear ladies! Wear this suit once a month for ten years = less than £2.50 per wear! Can you get your breath? You can’t even buy a skinny soya choccamoccalatte with that. £2.50 per month to feel a million dollars. Silk, tweed, iconic buttons, superb tailoring. Be rude not to. Click on the photo. You won’t be disappointed. Stunning vintage ear clips signed Edouard Rambaud. French haute couture runway pieces. 80’s Glamour! Fabulous quality and condition, and you can buy them by clicking on the photograph…. Vernon is a snail with excellent manners. He was the perfect subject to photograph. Vernon’s pretty nifty with a top speed of 50 yards per hour. Won’t get far with your cash, although he is quite strong, able to lift 10 times his own body weight. Vernon was born in 1970, in Stoke on Trent. He’s pretty retro. In super condition for his age, I thought he might make a rather lovely Christening present. Preferable to silver plated egg cups and Winnie the Pooh plates? Discerning purchasers can find Vernon by clicking on his photo. Be quick, he won’t hang around long! Here we have a really charming Tea Cosy. 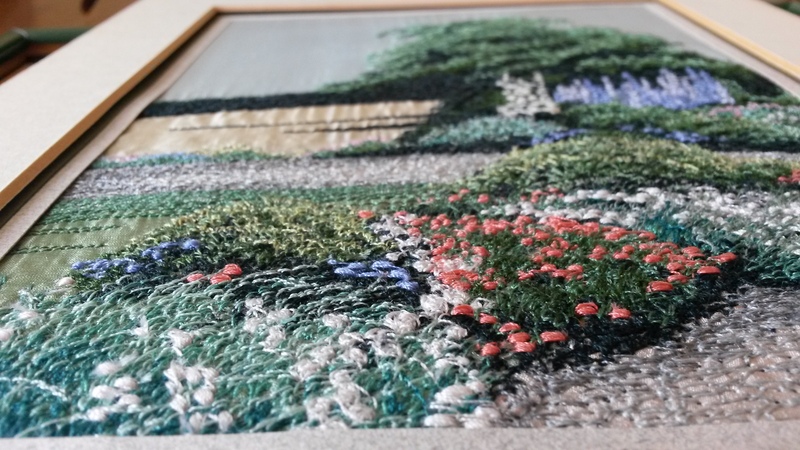 It’s beautifully hand embroidered in blue and white, with a rich navy velvet to the reverse. To keep your little tea pot warm. Whilst your brew steeps. How do you make your perfect cup of tea? Pour hot water (not boiling, never boiling water), over the leaves. Steep for 2 minutes if it’s red tea, up to 7 minutes if it’s green tea. Milk? How very dare you. The milk goes in after and definitely not before. And of course, if it’s loose leaf tea, which I certainly hope it is, because tea bags are just so infra dig, then once your cup is empty it’s time to read your leaves. Swirl the cup around, let the leaves settle, squint quite hard at the pattern remaining, and then using all your powers of imagination, turn the pattern into a shape you recognise. Dragons, Diamonds, Druids, Donkeys, Dentures, Dolphins, Doris Day. All of life is there. In the bottom of your cup. Which must be Bone China – it goes without saying. Only rather alarming looking words ending in …cyst. So it’s hardly surprising that there is little in the literary canon about the good old amethyst. It just isn’t poetic enough. Let’s try another approach. Take a look at the etymology. From the Greek ‘amethustos’ meaning ‘sober’, the amethyst will guard against drunkenness. Here then, is a beautiful amethyst necklace for the lush in your life, a lush not fond of poetry. Oh, and the Lady at The Telegraph, loves all things purple, especially the amethyst. It is the gem to buy in 2014.